One of the questions that I often hear, is "How long can I store the juice that I make with my juicer?" In this day and age, many people simply do not have the time to make fresh juice everyday, so people want to make a huge batch of juice at one time, and save it for use at a later time. Beneficial effects of juices may dissipate minutes after its made. The best (and worse) juicers to use when you want to store your juice. The best containers to store your juice. The best way to store your juice. Please note: When a juice changes color or tastes different, those are clear signs of oxidation and/or the juice going bad. When in doubt, throw it out. There are many beneficial nutrients contained in freshly made juice. The nutrients in the juice include: plant-purified water, vitamins, enzymes, minerals, proteins, fiber, carbohydrates, phyto-nutrients (carotene, lycopene, etc), chlorophyll, lipids, and probably other undiscovered substances. The minute you juice fresh produce, the cell walls of the produce break open, providing you with these nutrients. Many of these nutrients are very sensitive to air, heat, light and time and will cause their degeneration. Here is just one example.. In the 1940's Jay Kordich, "The Juiceman" worked with Dr. Garnet Cheney (Who headed the Cancer Division at Stanford Medical School). They were juicing fresh cabbage juice and giving the fresh juice to 65 volunteers. Within 3 weeks all but two of the patients were healed, and the two holdouts only had minimal symptoms.. Jay continues to say, "Vitamin U evaporates in a matter of minutes and needs to be consumed immediately.". Another example comes from "The Gerson Therapy" which is a therapy that Dr. Max Gerson used to treat cancer patients. The Gerson therapy specifies that juices are consumed with within 20 minutes of being made. So it should be clear, to get maximum benefits from the freshly made juice, don't save the juice.. So the best thing to do is to drink the juice immediately after you make it... Instead of thinking, ok, I will make a large batch once or twice a week, think, I can wake up 30 minutes earlier to make a fresh batch of juice for breakfast and the day..
2. How long can fresh juices be stored? Type of juicer used to extract juice - certain types of juicers produce a higher quality juice that can be more resistant to oxidation. Produce being juiced - For example, citrus juice tend to last longer, while apples tend to oxidize (turn brown) quickly. The way the juice is being stored. - Shortest time if kept at room temperature and uncovered. My personal preference is to never store juices. 95% of the time, I will drink the juice right after it is made.. If I do have to store juices, I will not store juice longer than 8 hours if made with a centrifugal style juicer. I will not store juice longer than 24 hours if using a low rpm style juicer (such as a twin gear or single auger style machine... These would be juicers #1- #8 in the list below). The manufacturer of the Green Power and Green Star Juicer claim their juices can be stored for up to 72 hours. I like to consume my juices well before this time. There are many styles of juicers available. Each style juicer extracts juice from produce using a different method. Please read the article, "The Best Juicer" to read about how these different styles work. For storing juice, you want a juicer that minimally oxidizes the juice as its being produced. So the design of the juicer, and the RPM have the largest effect on the storage of the juices being made. In general, you would want a juicer that runs at a low RPM (Revolutions Per Minute - or speed).. I would recommend the juicers in the following order: Twin Gear Juicers, Single Auger Juicers, Champion Juicers, Centrifugal Ejection Juicers, and finally Centrifugal Juicers. Here are the juicers I would recommend to use if you wanted to store your juice (1 is best... 14 is worst). The best juicer in my opinion to use if you want to store your juice is the Green Star Juicer. I would recommend using glass containers to store your juice. I generally use wide mouth mason jars, either 16 or 32 ounces. You can also use 8 ounce mason jars, amber jars or bottles. I also like to recycle glass bottles, and will reuse glass mineral water bottles to store juice. I prefer to use "wide mouth" jars vs. bottles, since juices do tend to stain, and cleaning a bottle with a narrow opening can be difficult. I would also recommend using a stainless steel lined thermos or stainless steel water bottle. Some people recommend using plastic to store your juice, and while plastic will work, I do not recommend using plastic. Studies have shown that plastic leaches into the food that is being stored. Some people say hard plastic (polycarbonate) NALGENE bottles are "safe", but new research is showing that even HDPE plastics leach toxins from the plastic into the food or drink being stored. One of the things to remember when selecting a container to store your juice is to choose a container that is small enough for a "single serving". A single serving is one that you will open, and drink all at once, and not seal it and save it for later. You might need to store your juice in multiple containers and bring 3 containers with you to work for each "juice break". The best container to store your juice is a glass container that holds as much as you can drink in a single serving. 5. The best way to store juice. The best way to store juice is in an air-free environment. 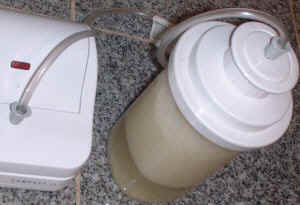 Air is one of the primary factors that will cause degradation of the juice. After you juice and have your juice is in its catch container, you will need to pour it into your storage container. You can pre freeze (or chill) the storage container to help keep the juice cold. When you fill your storage container, be sure to fill it to the brim, and maybe even overfill it a little before putting on the lid on the container. (You can add purified water if you do not have enough juice to completly fill the container) This is to minimize the air that is contained inside the container along with the juice. It is this air that causes some degradation of the juice. Even better yet, you can remove the air from the juice container. You will need a vacuum sealing device. These come in hand operated and electric units. I use a food saver appliance with the mason jar sealer. (see picture above). The best way to store you juice is in a vacuum environment that removes the air from the container the juice is stored. Remember to keep your juice COLD. 7. Other hints and tips and to store your juice longer. Juice an extra lemon into your juice for the citric acid that may help preserve the juice. Start out with the cold produce, to ensure your juice is cold. Use organic produce. In general organic produce has more nutrition that non-organic produce. If you must store your juice for long-term storage, one way it can be done is how people have been preserving fresh-made apple cider for many years.. they freeze it.. Of course, this should only be used as a last option and is not reccomended. Freeze larger volumes of juice is plastic "milk-type" jugs or plastic "water bottles". Defront and consume the whole juice after its defrosted. Use Glass or Stainless Steel Containers to store your juice. Remove the air from the container by "overfilling" or vacuuming out the air. Hopefully after reading this article, you will be likely to drink your juice right after it is made.. Of course, if you need to store the juice, you have the techniques to minimize the degradation.